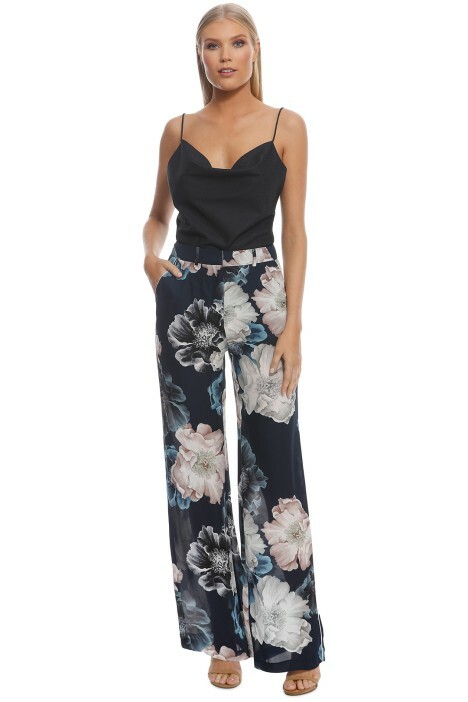 Make a bold style statement at upcoming events with the Navy Floral Palazzo Pant by Nicholas The Label! Rendered with a vibrant floral print, the pants feature fixed belt loops and contrasting white trims on the slanted pockets and at the sides. Effortlessly chic and on-trend, hire the pants for a work function or a cocktail party. Dress to impress at your cocktail party by teaming the pants with a silk camisole and gold statement earrings. Complete the look with a sleek ponytail and a crystal pod available for rent. Check out our blog for hairstyle ideas to try for cocktail parties! Pair this alluring pants with a simple cami or try Curious Top from Keepsake The Label. Navy Floral Palazzo Pant is rated 5.0 out of 5 by 1.